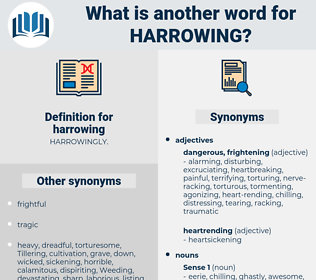 What is another word for harrowing? horrendous, frightening, disturbing, gruesome, harsh, alarming, dreadful, difficult, excruciating, daunting, challenging, heinous, painstaking, desperate, arduous, staggering, upsetting, tough, devastating, disgusting, egregious, flagrant, monstrous, grim, traumatic, scandalous, hideous, ghastly, disgraceful, miserable, disastrous, embarrassing. heart-rending, poignant, distressing, painful, shocking, agonizing, appalling, horrifying, horrific, horrible, terrifying, awful, dire, outrageous, atrocious, bitter, damning, tragic. reasonable, endurable, sweet, livable, bearable, tolerable, acceptable, gratifying, allowable, survivable, painless. There is really no need for her to stay here harrowing her feelings another moment. What wonder that together we wept tears of sympathy at the harrowing recital of the fate of John Rogers!